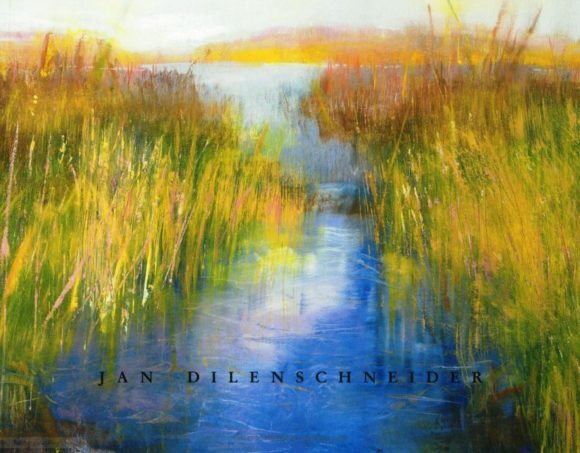 Talking with Jan Dilenschneider is entering a beautiful world of marshes, rushes swaying in the breeze, ponds reflecting the sky, and clusters of trees taking on the many hues from the painter’s palette contrasting with the softness of the wild flowers. 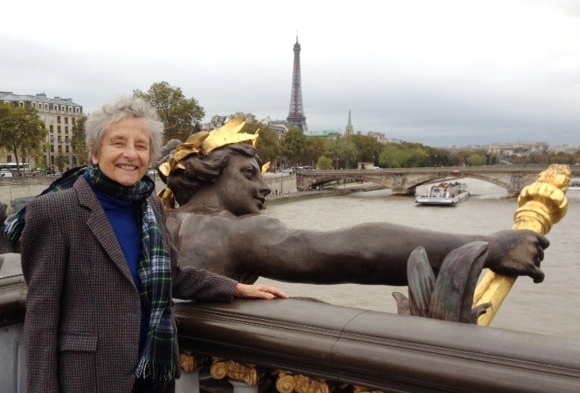 Dilenschneider is a Darien artist who has recently been making inroads on the Paris art scene. She was one of only a very few artists to participate in the “Art Paris Art Fair” held in March 2016 at the Grand Palais and, in a switch of continents, she will have a solo exhibition at the Sill House Gallery of the Lyme Academy College of Fine Arts in October of this year. For an artist, whose work so closely resembles Impressionism, to exhibit her paintings in the same year both in Paris and in Old Lyme – the home of the American Impressionism – is a remarkable and very special event. A classic work by Jan Dilenschneider. For the past three years, Dilenschneider has shown her work in Paris at the upscale Galerie Pierre-Alain Challier in the Marais district, close to the Picasso Museum. I was treated to a private showing of Jan’s paintings by the gallery’s owner, who knows her well. Then I had the pleasure of meeting Jan personally at the Grand Palais. Thanks to the badge Challier obtained for me, I was able to enter the giant steel and glass 1900 structure through the cavernous entrance reserved for the exhibitors. The Paris artistic calendar is overcrowded and art professionals are scrambling to find a time slot. The “Journal des Arts” describes the artistic events taking place in the spring as a “galaxy in fusion.” The last weekend in March is particularly in demand. It was therefore a real breakthrough for “Art Paris Art Fair” to be able to establish itself under the nave of the Grand Palais at that time. The Fair has a special format — only galleries can participate, not individual artists. This year, 143 major galleries from from 22 countries around the world showed their collections. All media are allowed, including sculpture, design, photographs or digital art. 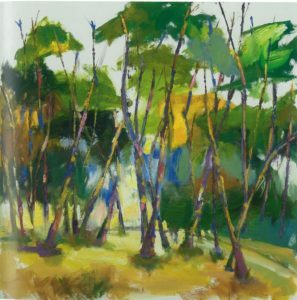 “Trees with broken color #2,” oil on canvas, 36″ x 36″, by Jan Dilenschneider. As I approached the Challier space, several potential buyers were looking at the gallery’s collection. A striking blonde woman was standing in front of one of her paintings – an icy white and blue landscape – being interviewed by a French television team from the Canal Sat network channel “Luxe.” It transpired the woman was Dilenschneider and after the TV crew left, she and I started chatting and did so for a long time. I immediately liked her as a person and was attracted to her sunny personality. Her passion for nature was contagious. In a video series named “Nec plus ultra,” produced by the “Magazine de l’art de vivre” of TV 5 Monde, Dilenschneider is shown caught in the throes of her creating process. She paints with gusto, happily digging into the colors lying heavily on her palette. She uses spatulas, all sizes of brushes, and even squeegees to diversify her technique. Painting is her way of meditating, which she says she can do eight hours a day. Even when she is not painting, she is taking photographs from trains, at airports … wherever she is, to be used in her future work. She wants to make people enjoy the beauty of nature and is happy to use her privileged situation to make an impact. With the help of her influential husband, whose communications counseling company is based on the 57th floor of the Chrysler building in New York City, she has created the “Janet Hennessey Dilenschneider Scholar Rescue Award in the Arts.” This year she rescued a Syrian artist, her husband and two sons. Although she has been painting since the age of 17, she has not exhibited her work until recently. Thus, she has long been a hidden treasure, which now finally all can enjoy. Editor’s Note (i): Dilenschneider’s exhibition at Lyme Academy College of Fine Arts opens Friday, Oct. 7. Editor’s Note (ii): This is the opinion of Nicole Prévost Logan.